Metal Gear Solid 3DS out November? Snake Eater aims for year's tail end. Konami has reportedly pegged Metal Gear Solid 3: The Snake Eater 3D - The Naked Sample for a November release in the UK. It's the first we've heard of the game since last October, when the publisher promised a European launch was coming. Konami will finally have Snake Eater 3D ready by Christmas, MCV understands. 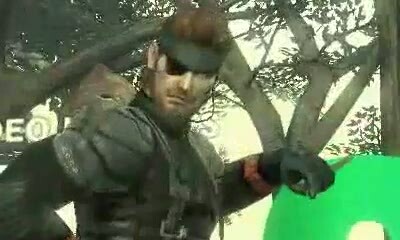 Almost a year after its E3 2010 reveal, all we have seen of Snake Eater 3D is a seven minute tech demo. At one point Konami even suggested the game would never exist beyond this form. The on-rails experience was engineered to exploit the the 3DS' technical capabilities. How much of the setting, if any, will remain? In the demo players had thumb pad control of the camera as Snake inched through a jungle setting. Crocodiles snapped their jaws at the screen, enemies loomed around tree trunks, and Snake dangled perilously from a wooden rope bridge, his legs swinging ungainly.